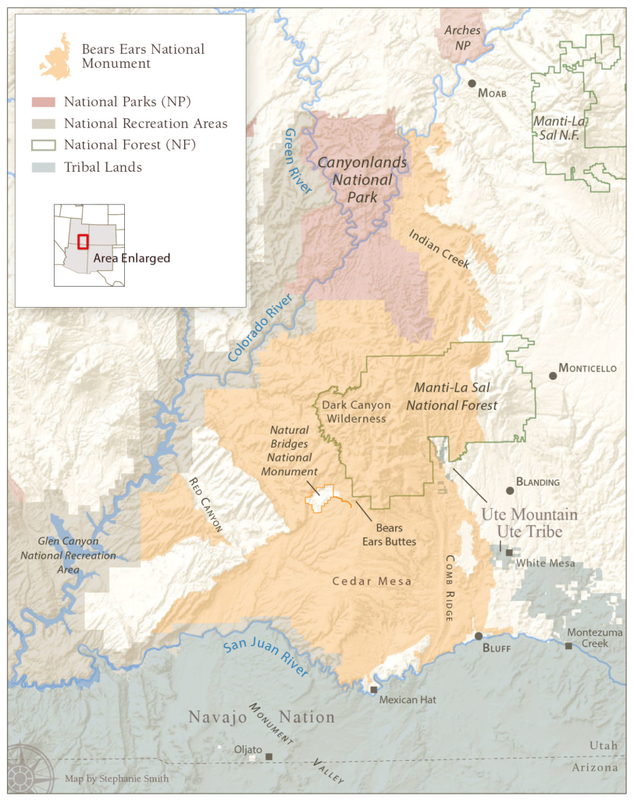 On December 28, 2016, President Barack Obama established Bears Ears National Monument, invoking his powers under the 1906 Antiquities Act to protect 1.35 million acres of land in San Juan County, Utah. Today, Bears Ears is under threat of rescission. These images may thus serve as either a celebration of the foresight of visionary leaders from Presidents Theodore Roosevelt to Barack Obama to protect lands that are an essential part of our cultural and natural heritage, or should President Trump and his allies succeed in rescinding Bears Ears National Monument, as an elegy for what was lost – for Native Peoples who advocated so passionately for the monument, and for future generations of Americans. We are honored to have Stephen Strom, Eric ​Descheenie, and Alfred Lomahquahu join us at Gallery 4 in the Gilbert Museum to discuss Bears Ears on Tuesday, October 10 from 6pm to 8pm. Eric Descheenie and Alfred Lomahquahu played key roles in establishing the Bears Ears Inter-Tribal Coalition. They will discuss the multi-year effort to have Bears Ears declared a national monument and ongoing efforts to protect the monument from rescission or contraction. Commission members will work with their federal counterparts in the Bureau of Land Management and the U.S. Forest Service to set policy for preserving ancestral sites and artifacts, and for providing access to monument lands for traditional cultural and spiritual uses. 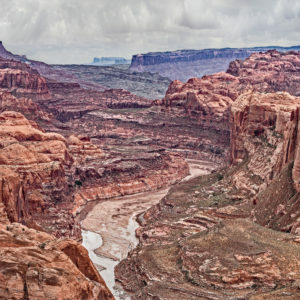 The canyons of the Colorado Plateau reveal in their layers and spires, uplifts and valleys the action of geological forces spanning almost 400 million years. They have witnessed the advance and retreat of oceans, the appearance and disappearance of rich tropical forests and sand dunes, the drift northward along Earth’s molten mantle, the uplift by more than a mile above sea level, volcanic ejections, and over the past 70 million years, sculpting by wind, rain and the paths of the rivers that run through it. The full drama of these events is recorded in the mesas, sandstone cliffs, pinnacles and hoodoos of the Plateau. At its center lies the junction of the two great rivers, the Green and Colorado. The rich riparian regions surrounding these rivers and their tributaries provided sustenance to the ancient Native peoples, whose petroglyphs, pictographs, pottery, cliff homes and granaries bear silent witness to once flourishing cultures. To their modern-day descendants, this land and its inhabitants remain sacred. Later, Mormon settlers were called to this arid land and through persistence and belief made it bountiful. Today their fifth and sixth generation progeny retain a strong cultural and spiritual attachment to the land as well. Minerals below and above the surface as well speak of the region’s rich geological history: coal and oil from tropical forests; sediments of potash deposited when salt-rich inland seas lapped over the land; and uranium-bearing rocks uncovered as the plateau was thrust upward. From the mid-19th century onward, miners and oilmen sought riches from the land. From the latter half of the 20th century onward, tourists and adventurers have been drawn to the land, along with those who seek silence, isolation, and beauty. Today, the Colorado Plateau finds itself the object of a struggle among Native peoples, the descendants of Mormon settlers, miners, energy producers, recreationists and environmentalists. Some see opportunities for development and growth based on extractive industries. Others wish to continue long-standing ranching heritage or to provide protection for the cultural heritage of Native peoples. Still others wish access to the land for recreation or veneration, while some view this area as so exceptional as to merit preservation as wilderness. In celebration of the Bears Ears Monument, Laura Tohe will read a short selection of her poetry during the closing reception of The Bears Ears: Seeking Common Ground on Sacred Land exhibition this Saturday from 4 – 6pm in Gallery 4 at the Gilbert Museum. Laura Tohe is Diné. She is Tsénahabiłnii, Sleepy Rock People clan, and born for the Tódich’inii, Bitter Water clan. She grew up at Crystal, New Mexico near the Chuska Mountains on the Diné homeland. Her published books include Making Friends with Water (chapbook); No Parole Today, a book on boarding schools; Sister Nations: Native American Women Writers on Community, co-edited with Heid Erdrich; Tseyí Deep in the Rock, in collaboration with photographer, Stephen Strom; and Code Talker Stories, an oral history book with the remaining Navajo Code Talkers. The Phoenix Symphony commissioned her to write the libretto for Enemy Slayer, A Navajo Oratorio, which made its 2008 world premiere as part of the Phoenix Symphony’s 60th anniversary. A compact disc recording of Enemy Slayer is on the Naxos classical music label. It received rave reviews by the Arizona Republic and was called “a triumph” by Opera Today. A poet, writer, and librettist, Tohe’s work has been published in such journals as Ploughshares, New Letters, cream city review, Red Ink, World Literature Today and many others. Her work has appeared in the U.S., Canada, South America and in Europe with French, Dutch and Italian translations. She has read her poetry internationally in the U.S., Europe, and South America. Laura holds a doctorate degree in creative writing, Indigenous American Literature, and American Literature. Laura is Professor with Exemplar Distinction in the English Department at Arizona State University and is an Arizona Speaks presenter for the Arizona Humanities that awarded her the 2006 Dan Schilling Public Scholar award. In 2015 Laura was honored as the Navajo Nation Poet Laureate for 2015-2017, a title given to her in celebration and recognition of her work as a poet and writer. The work to support Bears Ears National Monument will continue through the publication of a book by Stephen Strom and Rebecca Robinson. Hopi, Navajo, Ute Mountain Ute, Uintah, and Ouray Ute, and Zuni tribes will continue to play key roles in the ongoing effort to protect the monument from rescission or contraction. In preparing the material for “Bears Ears Country: Seeking Common Ground on Sacred Land” (University of Arizona Press, summer 2018) over 70 individuals were interviewed, we listened to people’s stories of their connection to the land – both supporters of the monument and those who were against its designation. There is a complex and nuanced story beneath the dramatic and inflammatory headlines, informed by a rich and storied history and embodied by individuals sharing a passion for Bears Ears Country. In telling the stories, in depth and with compassion and respect, our hope is that people will have a chance to be heard and will have a chance to hear others with openness to their different life experiences. And that through listening and caring, people can come together in respectful dialogue and find solutions that have eluded previous generations.